When you need to share or move large bodies data, the CERF Exporter has your answer. Looking for detailed CERF Exporter documentation on the CERF Online Help site? Your ELN should not be a place where “your data goes in, but never comes out.” There are many use cases where it may become necessary for you to export bundles of selected work for use outside of CERF. CERF ELN has several user-friendly ways to export individual data files, but exporting large numbers of files or migrating entire data collections to other servers requires a more advanced workflow. The CERF Admin Export function combined with the CERF Exporter app provide a great way to perform seamless bulk export of data from CERF. The CERF Admin can export work as convenient .ZIP bundles and the CERF Exporter App can be used to convert those .ZIP bundles back into standard files. Best of all, the CERF Exporter preserves the metadata that is vital to helping you understand the source and meaning of your data, maintains the original nested folder/file structure that the data had in CERF, and returns all data files to the original native formats they had when they were first added to CERF. Bulk exports must be performed by a CERF Admin using the Admin Web App. Under “Resources”, the Admin can select entire File Cabinets or Notebooks, or any portion of those collections, then choose “export”. A .ZIP bundle containing .XML files is prepared and downloaded to the client machine. This bundle can then be re-imported directly back to other CERF servers or imported to a new user on the same server. 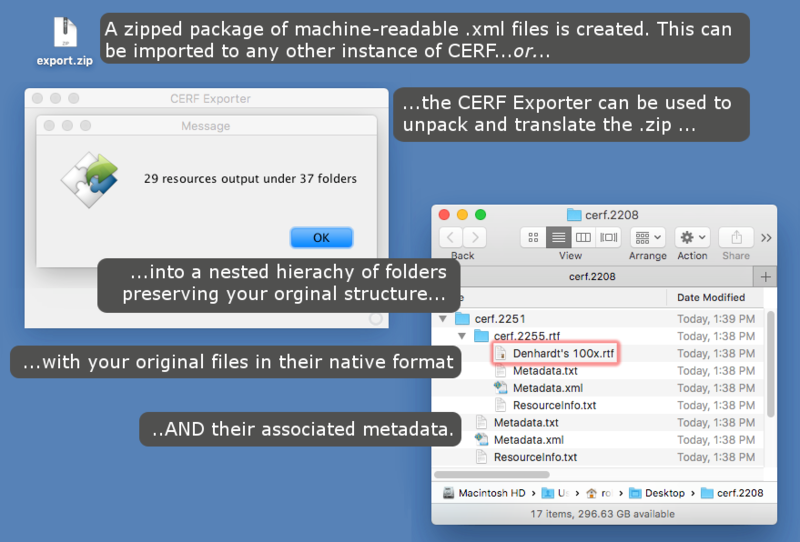 The CERF Exporter Application can be used to unpack and translate the content of the exported .ZIP bundle into a properly hierarchically organized directory containing all of the original files from CERF in their original format, plus all relevant CERF metadata for all files and containers. This is especially useful for preparing a meaningful collection of data and metadata for scientists who are leaving your organizations and have been given permission to take a copy of all of their data with them. Users can also choose to extract files from the exported .ZIP archive as a flat list of files minus metadata, or under some circumstances, it may be useful to choose the option to extract only files of a certain type (eg only .xls files) from the .ZIP archive and deposit them as a flat list. 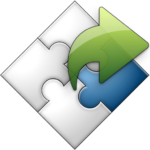 The CERF Exporter is extensible, and we plan to add other options and capabilities over time. Our vision for the exporter is that it will become part of powerful new workflows that will allow users to assemble custom subsets of data from within CERF which can then be used in various analyses.